The director of Caritas Somalia: "To remain faithful to the Lord makes our life fuller"
Mgr. Bertin: ISIS has arrived in Somalia; "The interests of various international partners increase the Somali instability"
Elections in Somaliland, Mgr. 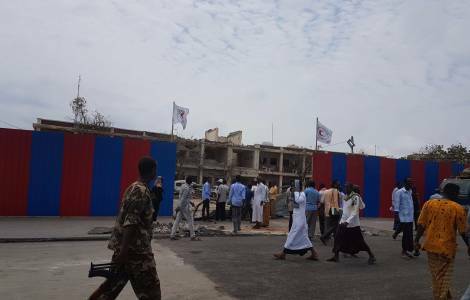 Bertin: "Democracy is possible in the Horn of Africa"
Mogadishu (Agenzia Fides) - A few days after the bloody attack in Mogadishu by Al-Shabaab, a Somali terrorist group, which killed more than three hundred people and hundreds were injured (see Fides 16/10/2017), Perigeo Onlus has sent a reconnaissance team to Mogadishu: Gianluca Frinchillucci, Strategic Director of Perigeo, who handles relationships with Somalia; Francesco Saverio Giovagnoli and doctor Claudio Tabarretti, in coordination with the Somali ambassador in Italy, Abdirahman Sheik Issa Mohamed. Frinchillucci reports to Fides: "A control of the conditions of local structures has been initiated to organize an aid network by collecting the indications of health directors involved in dealing with the emergency caused by the terrorist act. The information obtained will be used by Perigeo to begin, along with other onlus and Italian realities that intend to provide concrete help to Somali healthcare facilities, a collection of medicines and equipment wanted and coordinated by the Embassy of Somalia in Rome". "The local institutions that have welcomed the Perigeo Italia leaders, continues Frinchillucci, are convinced that only concrete actions with cultural commitments and international physical presence can be useful to cope with the terrorist threat".